Receive personal answers to your questions. Orders placed after April 16th will not arrive in the US before 5th May. We aim to ship all new orders between 28-30 April for delivery within 4-10 days. A valid prescription is required to buy Menopur online. * The price comparisons are based on the published GoodRx.com prices, January 2017. Menopur is a highly purified preparation of naturally derived gonadotropins, called hMG. Menopur contains equal amounts of two kinds of hormonal activity: follicle-stimulating hormone (FSH), which helps stimulate egg production, and luteinizing hormone (LH), which helps the eggs mature and release. Menopur helps stimulate eggs to mature in women whose ovaries are basically healthy but are unable to develop eggs. It is not used for women who suffer from ovarian failure. Menopur is usually used together with human chorionic gonadotropin (hCG), and is indicated for the development of multiple follicles and pregnancy in women participating in an Assisted Reproductive Technology (ART) program. Menopur can also be used to stimulate the production of sperm in men who have functioning testes but in whom hormonal stimulation is deficient. Menopur is sold as packaged by the manufacturer in boxes of 10 X 75iu vials of Menopur. Dilutant/solvent is also included. Menopur is available for purchase as individual vials. Menopur is packaged in boxes of 10 vials, individual vials are not available for purchase. Contact us and receive expert and personal answers to your questions. Menopur helps treat fertility problems. 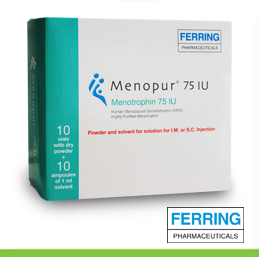 Menopur is a medication containing follicle stimulating hormone (FSH) and luteinizing hormone (LH) needed for healthy ovaries to produce eggs. Menopur is normally used in combination with an HCG (human chorionic gonadotropin-hCG) drug. It helps women who are trying to conceive but are having fertility issues by bringing about the growth and release of a mature egg (ovulation). Common Menopur side effects include: Headache, mild stomach pain/bloating, redness/pain at the injection site, breast tenderness, or dizziness. Serious Menopur side effects that require medical attention include: Flu-like symptoms including fever, chills, joint pain, muscle ache and tiredness, weakness on one side of the body, slurred speech, sudden vision changes, sudden severe headache, pain/swelling of the calf muscles, chest pain, shortness of breath or signs of OHSS (Ovarian Hyperstimulation Syndrome). Symptoms of OHSS to watch out for include: Severe pain/swelling in the lower abdominal (pelvic) area, nausea/vomiting, sudden/rapid weight gain and change in the amount of urine. The prices IVF Pharmacy has cannot compare to anywhere else. The ordering process was easy and quick. Delivery from out of the country was way quicker than expected. Less than a week. Meds were not expired or damaged. We’ve been trying to get pregnant for 4 years and have gone through 9 rounds and ivfpharmacy has had the best pricing, quickest delivery, and great customer service. My meds always come right on time and any time I have a question someone is always there to help. I would reccomemd Ivf Pharmacy to everyone having to go through this stressful and expensive process. Highly recommend them and will use them again if I need to. Customer service to payment to delivery everything went smoooth. We appreciate your wonderful customer service and quick communication through the buying process! We're happy to answer your questions. Take advantage of our excellent customer service. Due to international time differences, a customer service representative is not always available to take your call. Please leave a voicemail message and we will return your call at the earliest opportunity. IVFPharmacy is not an Israeli Online Pharmacy and is not licensed by the Ministry of Health, therefore IVFPharmacy does not supply medication within Israel. Do you need to order a Follistim pen? Follistim comes in cartridges of various sizes. These cartridges require a reusable Follistim pen ($15) which has not been ordered. Would you like to add a pen to your order? Due to circumstances beyond our control, we will be unable to ship medications from Monday August 7th - Monday August 14th. If your order is required before August 21st, please contact customer service before placing your order or sending payment. Our Customer Services department will continue to operate as usual and is available to assist you with any questions regarding this delay.